Moorish Idol are extremely common in the Indo-Pacific and around the reefs of Thailand, so if you’re snorkeling in the area, you’ll be almost certain to see them. They are the sole species in the Zanclidae family. 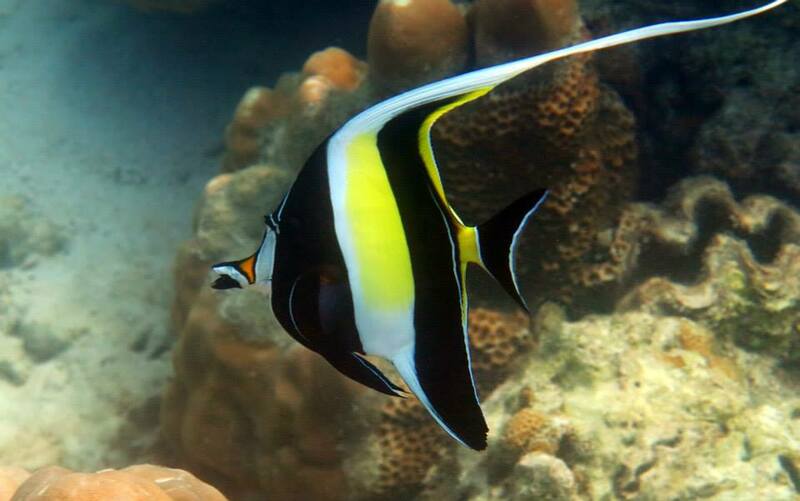 The Moorish Idol has a laterally compressed body with bright bands of black, white and yellow. They have a large dorsal fin with six or seven spines. These come together to form a long elongated philomantis extension, which trails behind them. Another prominent feature is their long tubular snout, containing bristle-like teeth. Moorish Idols can reach a maximum of 23 cm. They are very similar in appearance to the the schooling banner fish. Banner fish are usually seen in bigger groups, whereas Moorish idols are usually in pairs. Moorish idols can be distinguished from banner fish by the orange triangle on their snout. Moorish Idols live in tropical and subtropical waters, mainly around reefs and lagoons. They prefer shallow waters, above flat reefs in particular. At night, they stick to the ocean floor and hide in the coral. Moorish Idols are omnivores; they eat coral polyps and sponges, and also tunicates and other small invertebrates, such as shrimp. Moorish Idols is that they mate for life. A pair will stay together throughout their lifespan. They are pelagic spawners, which means they release their eggs and sperm in the water column. Moorish Idols have an unusually long larval stage before they become juveniles, it needs to reach a length of 7.5 cm. Then the juveniles move onto the reef to feed and they grow rapidly. Juveniles tend to congregate in small schools until they reach maturity. Adult Moorish Idols spend most of their time alone, or form small groups of 2-3. The name comes from the Moors of Africa, who thought the fish to be a bringer of happiness. 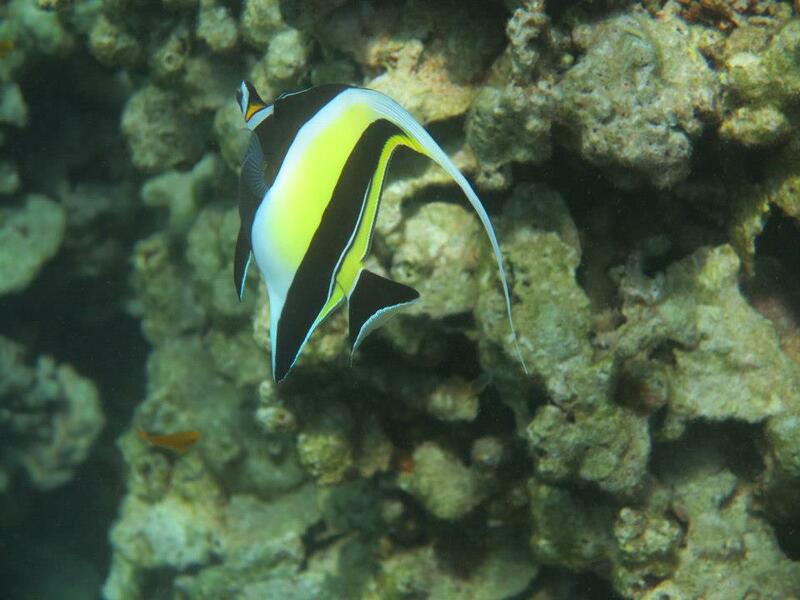 In Hawaii, the Moorish Idol is called ‘Kihikihi’, which means ‘curves’ or ‘zigzags’. Although a popular choice for saltwater aquariums, they have difficulty adjusting to captivity because they are very active fish and need a lot of swimming space. In Finding Nemo, one of the fish in Nemo’s tank, Gill, is a Moorish Idol.